I placed the two dds files in the Fallout 3\Data\textures\architecture\urban folder, but I'm not seeing them, only the original versions. Any ideas? Late reply, but did you turn Archive Invalidation on and off in NMM? Or if you insist on doing it manually, do you have ArchiveInvalidation Invalidated installed? 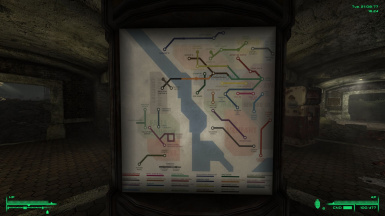 Just I thought I had, if you want to make the map make more sense pre-war wise, you could name those stations something like 'Unfinished line' or some other name, then have writing over it that has the gameplay-wise name that you have. Like as if someone wrote with a marker over it to help keep others safe from the dangers, which it has been awhile, but I'm petty sure Reilly's angers was one such group that was trying to make D.C. safer for people. At any rate, this looks awesome, thank you! I thought of doing that but since I don't know which font Xiempie used when creating the original picture, I would have to manually cut and paste every single letter and I'm too lazy to do that :D (plus it would look real bad). 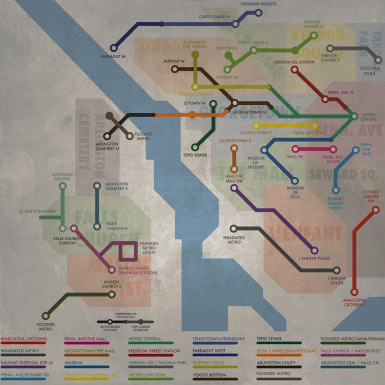 Your best bet would be to print the map or have it opened on a second screen (that's what I do). Thanks for this. It's finally done correctly. I'm getting ready to start a LP of Fallout 3 and the timing couldn't be more perfect. Cheers!!! His goes for a way more worn-out look, to the point that you can hardly make out some of the names while mine tries to stay legible, arguably to the cost of some realism. Mine also has the line names and key included on the bottom. I do like the key at the bottom of the map. I'll try this one out. 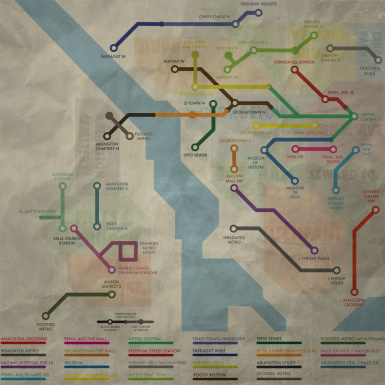 As requested by vegaswanderer, I've added an optional more faded, yellowed and crumpled version of the map. 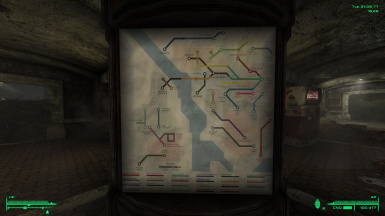 I've also added the option to use the original, not *too* dirty, texture for the lightbox and the worn-out and creased texture for the map used on bus stops and such.